Since the launch of Google+, Google has been putting a lot of muscle behind promoting and integrating the service into its core products. Fire up a new Android 4.0 device, and you’ll be prompted to create a Google+ account if you haven’t already. They’ve given it TV ads, not to mention a priceless promotion on its homepage. And today, Google is launching an update to its core search engine at Google.com that continues this trend — and then some. They’re calling it ‘Search plus Your World’. The short version is that Google search results are going to be automatically personalized (to a greater degree than they were already) for each user, with signals drawn from your Google+ Circles being used to highlight things your friends — or you, yourself — have shared. Any of these personalized matches will appear alongside ‘normal’ search results. And Google will also pull in photos shared on Picasa or Google+ (they’ll even show up if you’ve marked them private, but they’ll still only be visible to you). This is probably easiest to understand with an example, so here goes. Say I was to run a query for the term ‘Harry Potter’, as I am wont to do. For most people, this would probably pull up links to the books, the films, and a variety of fansites. For this intrepid reporter, though, the results would also include my Picasa album shot at a Harry Potter premiere a few years back (and labeled as such). These images would pop up both in the main search results page, and in Google Images results. Likewise, any blog posts my friends had shared on Google+ about the boy wizard would show up in my results too. This may not sound like a huge deal, but it’s foreshadowing a bigger change to come: Google is going to increasingly become a search engine for all of your stuff. It’s starting small, with Google+ and Picasa integration. But over time we’ll likely see results from Google Docs, Gmail, Contacts, Music, Voice, Wallet, and so on. You’ll go to Google.com, type in whatever it is you’re looking for, and you’ll see both your own content alongside web results. It’ll be an Omnibox for everything, and if it figures out a way to incorporate third-party data as well (be it through partnerships or APIs), it could be very powerful. Of course, Google isn’t confirming any of that yet (they don’t comment on future releases, etc.). But when I posed the scenario to Jack Menzel, Product Management Director of Search at Google, he seemed to indicate that I was on the right track. Anyway, that broader search functionality is still likely a ways off. So let’s get back to the things that are being introduced now. Today’s launch also uses Google+ data for another purpose: helping you search for information about people whose names typically make that a difficult task. Say you wanted to run a query for someone named Roger Smith on Google. This would typically be pretty tough, as there are a bunch of people named Roger Smith. But with this launch, Google is making things potentially easier. Type in a name in the new version of Google, and an autocomplete box will pop down that includes results from Google+. You may see several Roger Smiths, but you’ll also see their profile photo, current city, and a link to their Google+ profile. Click the one you’re looking for, and Google will try to serve up results pertaining to that particular Roger Smith. Which is both cool, and, to some people, potentially frustrating. There are plenty of people who, for whatever reason, have photos or blog posts online that they’d rather not have other people find. Some of them are fortunate enough to have a common name (or to share a name with a celebrity) that ensures these stories don’t get surfaced very often. This could change that. Google is also going to start promoting certain Google+ users within search results. 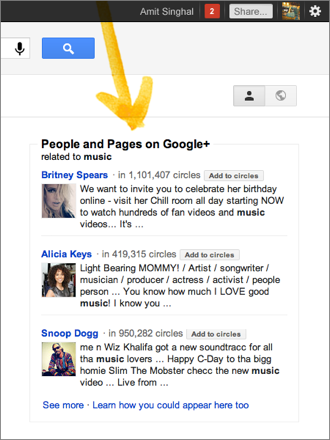 Search for ‘music’, for example, and you may see a handful of prominent musicians on Google+ (say, Britney Spears), along with some handy ‘Add to Circles’ buttons. This could be interesting as a sort of topic-specific suggested user feature (particularly if it works on niche topics), and it’s also obviously a way to promote Google+ to users who have yet to sign up or have stopped visiting. Finally, the launch includes a few options for managing the new features. A new tab will let you select either the ‘Search plus Your World’ results, or you can toggle back to the old-fashioned, unpersonalized results. There’s also an option in Google settings that will let you opt out of the experience entirely. Google also points out that SSL is now turned on by default for all signed-in users, which is even more important now that it’s personalizing results. To be clear, this is far from the first time Google has personalized results. It’s been doing so for years, with products like its ‘Social Circles’. Even the now-defunct Google Desktop Search would incorporate files stored on your hard drive into your web-based search results. And the idea of integration social with search isn’t unique to Google, either — Bing has had a longstanding partnership to use Facebook data in its results, and it will also serve up posts your friends have shared alongside its search results. The key, Menzel says, is that Google is getting a lot better at figuring out when to incorporate this socially relevant data. They’re focusing on showing content not simply because your friend shared it — but because it might actually be helpful. And, as I said earlier, this is really just a taste of things to come. Expect to see Google+ integration go even deeper soon, and for more of Google’s other services to be accessible via one single, universal search.